Since 1943, TOBAN TEXTILE has been leading the industry in yarn dyeing fabrics from the Nishiwaki prefecture. To meet the needs of this constantly evolving world, we maintain the latest technology in every department and focus our attention daily on new product development. 44 cheese dyeing machines and 16 beam dyeing machines -- we possess over 60 dyeing machines all with a full range of capacities. Because of this, we are able to dye one lot of small sums (one cheese) up to large sums (273 colored cheeses). By making full use of the data that we have accumulated over many years and CCM (Computer Color Matching System) , we are able to accurately match any desired color without compromising the quality. Reactive Dye, Disperse Dye, Acid Dye, Sleng Dye -- we first find the best method for each fabric, and we are then able to finish the dye perfectly to your desired color. 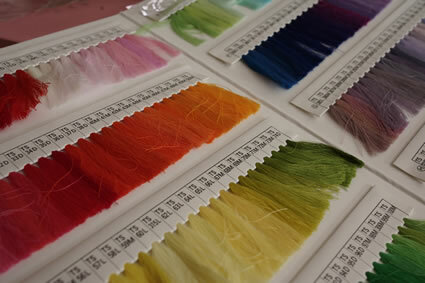 From vivid colors to smokey patterns, we will complete the dye with an excellent colofastness. 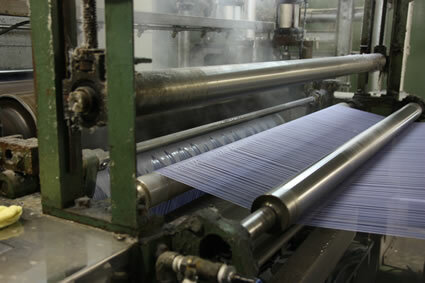 With a traditional RT Winder, Polyester and Nylon thread were impossible to be winded as soft winding. 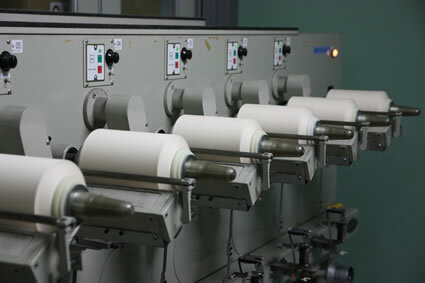 With our SSP Winder, we've been able to take these threads and complete a soft winding and to dye. 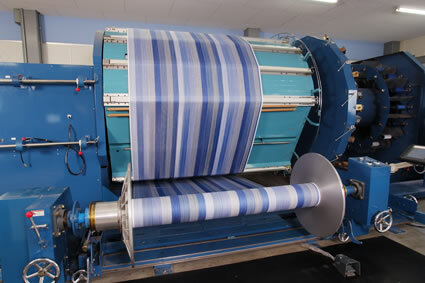 With some warp yarn of fabrics, sizing can be necessary to maintain strength retention and the fluff. 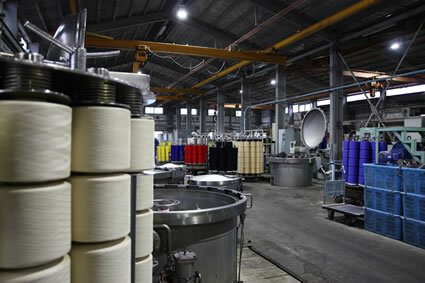 Beam sizing is the method in which thread that has been beam dyed is simultaneously sized with the warp yarn's necessary colors and thread count. As a result, delivery time and quality are both drastically improved. 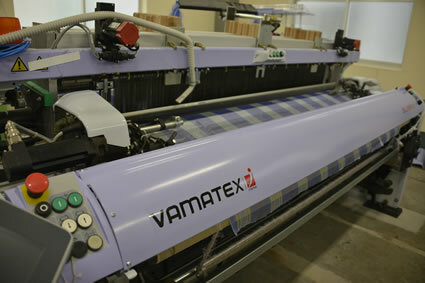 All machines are made to support a width up to 150cm with up to 8 different colors of filling yarn. Our rapier looms can support up to 180cm, and because they can achieve warp with all materials, the density can be adjusted freely to produce textiles with super fine threads or high density weaves. The preparation process of warp yarn had always been done by hand -- until now. 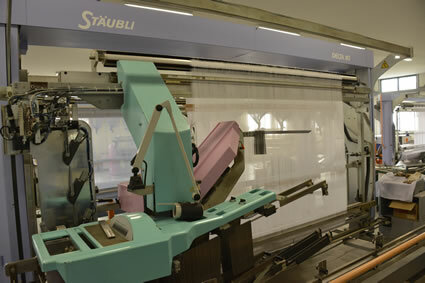 By skillfully using both the reaching and auto drawing machines, we have eliminated the manual labor and have thus significantly shortened the lead time. 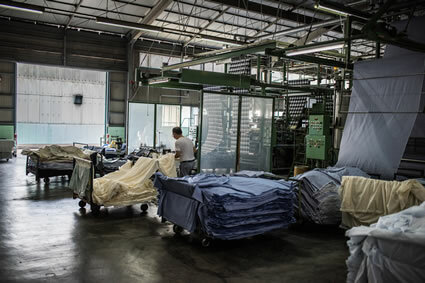 Our machines are maintained in air conditioned facilities that are carefully regulated to create the ideal environment for the fabrics. This optimal environment strongly improves the rate of operation. Additionally, we have monitoring systems installed on all machines, allowing us to follow the production status in real time. To create samples, we use the cheese sizing machine and the sample warper within our factory. We do this not only for sample creation, but to also accommodate small lot orders. Cotton and other cellulosic fibers require slight reforming to ensure a perfect finish. Liquid ammonia treatments eliminate any distortion and slipping that could occur between fibers. 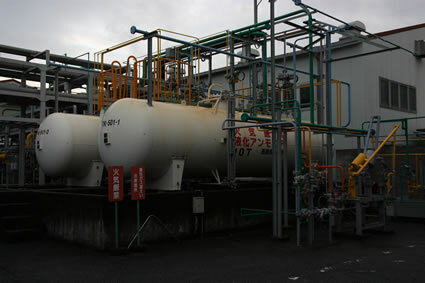 The "Platino", "La Rouge" and "S-Cotton" all originated from this liquid ammonia treatment. We take advantage of the many different textures that our customers request to improve our database. With this vast index, we can find the right combination of the various processing materials available at Toban-Senko to create your desired texture. This is done, of course, while still paying close attention to the physical properties and carefully supervising the database. With three different kinds of rising machines, we are able to express various staples and touches such as flannel, peach, and shaggy among others. Additionally, by combining different types of relaxors and dryers, we can also achieve washed out textures and wrinkled finishes. Beginning with resin processing and antibacterial sterilizing, we are able to grant various planes of functionality such as deodorizing, cool feelings, warm feelings, UV cuts, water absorbing and quick drying among others. Because we use the best binder for all functional chemicals, we can complete this without compromising texture or washing durability. We have combined the skills of our dyeing department and processing department to make piece dyeing possible via a jet dyeing machine. The kneading and?beating effect that can be attained with this machine is a step different from continuous dyeing and results in a softer touch. Piece dyeing is possible from a one roll dye in a small lot. 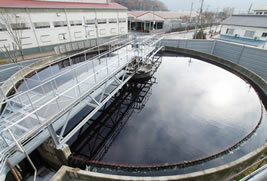 At TOBAN TEXTILE, we have our own waste water treatment facility. Our water quality control is just one way in which we help to preserve the environment and progress our harmony with nature. We aim to be an "earth friendly" factory. 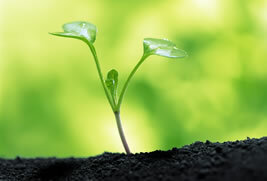 At TOBAN TEXTILE, we uphold strong principles in giving back to society and living harmoniously with the environment. As one of the few manufacturers that honors Japan's most historical BANSHU yarn dyeing, we have the responsibility to pass these legacies on to the next generation -- and to do so, we must also work to preserve this irreplaceable earth. Alongside our progressive efforts in technology development, we take great efforts to ensure the prosperity of this ever-changing world. 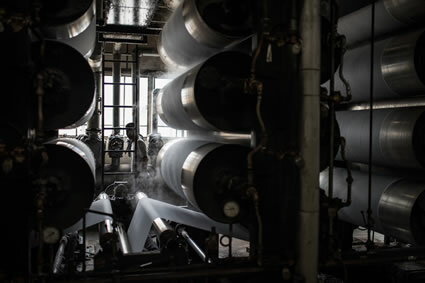 The inevitable waste water that results from dyes and processing is actually placed in a water storage tank and goes through a treatment cycle within our own quarters. After an initial PH adjustment and aeration treatment, the water goes through aerobic treatment, a precipitation process, and flocculation pressure treatment before being discharged back into the river. 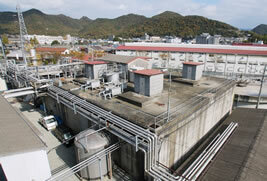 The quality of this water flow is checked for 24 hours with the automatic COD measuring device and follows the strict codes of the Seto Inland Sea. Garbage from our premises is separated and taken by our traders. Cardboard boxes become raw material for paper, and plastic bags are ground into small chips and recycled as fuel for power plants. The Hyogo Prefecture Textile Dyeing Union has become the subject of much attention after promoting our waste water treatment methods. The organic mud/sludge that each factory has processed in house is combined in a co-sludge processing facility, where is the sludge is dried and granulated into sand. This sand is completely turned into compost at our contractor's factory, and afterwards it is used as a fertilizer for the surrounding agriculture. The nitrogen oxide that is emitted from the boilers is filtered and monitored daily through flue-gas desulfurization units. As a result, our nitrogen oxide levels are drastically decreased to stay well below the environmental criteria.